With multi-coloured kites filling the morning sky, the most auspicious time of the year for Hindus – Makar Sankranti - officially begins. This is the time for households in all parts of the country to get busy offering their prayers to the sun god to celebrate the beginning of Magha month. Observed in different ways that vary with location, it is never complete without a feast including delicacies made with sesame and jaggery, halwa, pitha, and more. As per Hindu mythology, sesame seeds (til) help purify the soul and boost spiritual awakening. Ayurveda also mentions the health benefits of til in winter - which includes warming the body. No wonder sesame seeds are used in almost every Makar Sankranti recipe. This year, make your celebration more special with the following treats. Known to have originated in Bikaner, this Rajasthani dessert adds its own sweetness to Makar Sankranti. Made of flour and pure ghee, this winter-special treat comes in multiple flavours. 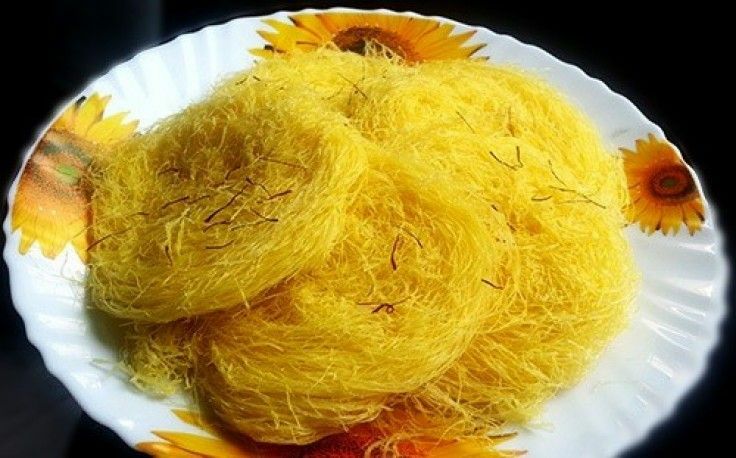 This spaghetti-like speciality carries the true flavour of the desert state and is a must during this January festival also known as ‘Sankrat’ here. Apart from enjoying special feats, it is customary for all married Rajasthani women to gift household items to each other. Buy fini online today and give your celebration a western twist. In Marathi culture, til-based sweets are exchanged on this occasion to forget past differences and restore friendship. When it comes to adding sweetness to a relationship, what better way to do so than share a chikki together? If taking a holy dip in rivers such as Ganga, Yamuna, Krishna, and Godavari is a spiritual must during Makar Sankranti, authentic chikki from Lonavala is a gastronomical must this time of the year. A traditional Indian candy bursting with health and flavour, this perfect confection of sesame seeds and jaggery is loved by all. Chikki comes in various flavours such as peanut, coconut, dry fruits, and more. However, for this special occasion, buy til chikki online for your family and friends. In Gujarat, Makar Sankranti is celebrated for two days with kite flying, family gatherings, and feasts that must include til laddu. A healthy substitute for chocolates, til laddu is a famous treat made of sesame seeds and jaggery. This popular laddu is a rich source of minerals and helps to lower high blood pressure. This Makar Sankranti, surprise your guests by serving them original til laddu from Bardoli. This delicious, traditional sweet made of dry fruits, jaggery, and sesame seeds is a speciality of Indore. A perfect way to keep your body warm in winter, this crispy, crunchy treat is a must-have during Makar Sankranti. Order gajak online today! This popular Rajasthani winter dessert, made of sesame seeds and ghee, is a thin, translucent treat loved by all ages. Til patti is a rich source of iron and is given to expecting mothers to boost their haemoglobin level. To make your celebration special, buy til patti online today. Also known as Pongal, Makar Sankranti is a four-day-long festival in Tamil Nadu. It is customary to throw away old clothes and wear new ones on the first day of this festival. The grand feast on the final day involves many regional delicacies but the absolute must-have is the Tirunelveli halwa. Made of fresh cow ghee and cashew nuts, this speciality of Tirunelveli is a treat to die for. The unmatched flavour of this unique dessert, made with water from the river Thamirabharani, is irresistible to say the least. Discover the real taste of South India by ordering authentic Tirunelveli halwa online. Wondering what is the best way to spend the Makar Sankranti evening? How about munching on some freshly delivered gud chana with your entire family? This sweet snack, made of Bengal gram and jaggery, is perfect for expecting mothers and health-conscious individuals, thanks to the high iron and negative calorie content. Order gud chana online early to avoid the last-minute rush. Every Assamese person knows the joy of waking up on brisk January mornings to the smell of delicious til pitha being prepared for the coming Magh Bihu. This famous eastern delicacy is a thin, oil-free pancake with sesame seeds and jaggery filling. A healthy delicacy, til pitha is a must-have during this important festival. Surprise your guests by serving them this unique treat along with some hot beverage. Buy til pitha online today. Honestly you don’t need an occasion for enjoying some high-quality dates. This healthy dry fruit comes with loads of health benefits and makes for the perfect way to break your fast. You can choose from a wide variety including imported dates, crushed dates, dates with almonds, dates with hazelnuts and chocolate, and mabroom dates. Give your Makar Sankranti celebration a healthy boost by ordering dates online today. Jaggery is a healthy sweetener that is indigenous to India. This natural item is an absolute must-have during Makar Sankranti. You can use jaggery as a dip for your steaming rotis, or use it as an ingredient for your homemade sweets and pitha. Buy natural jaggery online and kick start your preparation for Makar Sankranti.